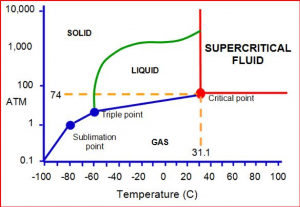 Supercritical Carbon Dioxide (scCO2) refers to carbon dioxide (CO2) that is in a fluid state when both its temperature and pressure are equal to or greater than the critical point. CO2 usually behaves as a gas under standard temperature and pressure conditions (STP), or as a solid when frozen (dry ice). When the temperature and pressure are increased above the critical point (31.1°C, 74 atm) CO2 becomes scCO2 and develops properties of both a gas and a liquid. scCO2 is non-toxic; has a low environmental impact; and is a powerful solvent.. The critical region of CO2 is characterized by an ability to control solvent power with only minor changes in pressure and temperature. The properties of scCO2, such as its solvency, gas-like viscosity, diffusivity, compressibility, and very low surface tension, facilitate penetration of CO2 to the interior of dense products such as bone tissue. As a result, NovaSterilis’ sterilization additive is carried to hard to reach areas, resulting in the inactivation of embedded pathogens. UsingscCO2 for terminal sterilization began with the idea that scCO2 has certain disinfection properties. NovaSterilis has expanded and optimized the technology, producing a viable patent protected, terminal sterilization process. scCO2 sterilization achieves total inactivation of bacterial, viral, fungal and yeast pathogens. When the potency of the Nova Process™ is coupled with the benign nature of CO2, the results show an effective approach to sterilizing medical grade products; many of which previously could not be sterilized using conventional means. At NovaSterilis, we welcome all inquiries and are open to exploring new applications for our scCO2 sterilization technology. Please use the contact information on this site for questions or potential collaborations. NovaSterilis is committed to sterilization and has developed a process that achieves a sterility assurance level of 10-6(SAL6), or the probability of one contaminated item in one million. We are also constantly working to improve the process and test organisms that are important to our customers including bacterial spores, viruses, yeast and molds. When assisting customers to develop a sterilization cycle time for their product, we utilize the overkill method and inoculate that product with 2 X 106 Bacillus atrophaeus to ensure that we are getting SAL6 efficacy. 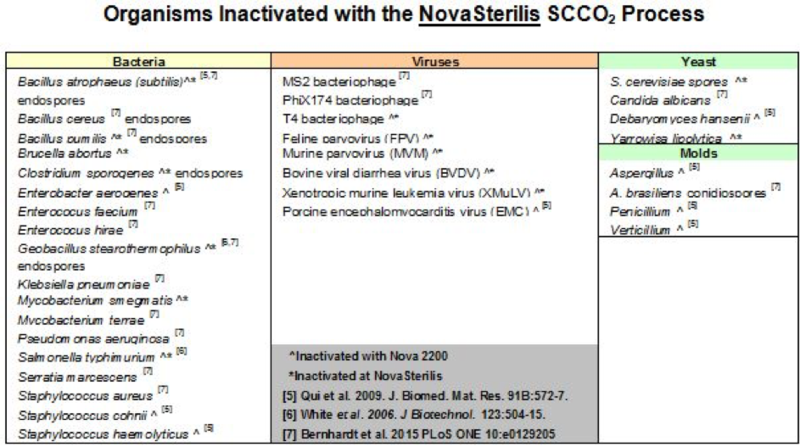 NovaSterilis has achieved SAL6 with the bacteria listed below, and we have found that viral pathogens are easily inactivated in scCO2, which is not the case with gamma irradiation. If you have a specific pathogen you wish to test, please contact us to discuss. Although effective, gamma radiation is known to reduce the strength of tissue by disrupting, or denaturing, the collagen building block. A 2012 journal article in Cell Tissue Bank by William Walsh established the effect of 25 kGy gamma, 10 kGy gamma, and SCCO2 sterilization on bone. In this study they used 3 point bending, 4 point bending and torsion to analyze the mechanical changes to bone post-sterilization. This paper confirmed 25 kGy radiation had a significant effect in all tests, and 10kGy showed moderate changes in 3 point and 4 point bending but statistically significant effects in torsion testing. scCO2 showed no measurable effect in all three areas providing valuable evidence in maintenance of mechanical properties. Multiple studies have demonstrated similar results in soft tissue including tendon, acellular dermis and amnion. NovaSterilis’s process provides a safe and effective sterilization process for allograft, xenograft and other delicate materials maintaining vital physical and biochemical properties while achieving SAL6 in final packaging. In addition, gamma radiation is challenged by many viruses, even at high levels of radiation that are otherwise damaging to biological tissue. Ethylene oxide (EO) sterilization is a chemical process consisting of four primary variables: gas concentration, humidity, temperature and time. EO is an alkylating agent that disrupts the DNA of microorganisms, which prevents them from reproducing. EO is a carcinogenic, mutagenic and highly flammable/explosive chemical that is widely used in sterilization. It is highly effective for sterilization but residual EO in many products, for example allografts, limits its use. The EO process, due to required outgassing, is a significantly longer process than scCO2 and may reach temperatures that are slightly higher than what is acceptable for some biopolymers. scCO2 combined with NovaSterilis’ proprietary sterilization additive NovaKill™ provides a fast, low-temperature alternative to EO. NovaKill™ is used in extremely low quantities and any residual quickly biodegrades to 2 harmless products. A typical cycle time for scCO2. varies from a ½ hour to 6 hours based on the material, and there is no long outgassing process in the chamber. Over 70,000 allograft tissues have been transplanted using NovaSterilis’ scCO2 process with no adverse reports, adding real life support for this green process. NovaSterilis was a past recipient of the Presidential Green Chemistry Award presented by the EPA.